Checks are less common than they used to be, but some businesses still have a lot to gain by accepting checks. The Federal Reserve Board reports that roughly 18 billion checks were written in 2012, so there are still plenty of people who insist on paying by check. The challenge for businesses is avoiding bad checks. You never know for sure if customers have money in their checking accounts, and it is expensive and time-consuming when checks bounce. So, what can you do to reduce the chances of accepting a bad check? You probably do this anyway, but if you don't, it's time to start. Verifying a check writer’s identification helps you make sure that the person handing you the check is the same person who owns the account. You should also check (and copy down) the address on the ID to see if it matches the address on the check. If the addresses don't match, it doesn't mean you're getting a bad check, but it’s worth knowing (this, in combination with other oddities, might point to a problem). Insist that all checks are signed at your place of business (assuming customers come to your place of business). Compare that signature to the signature on the ID to make sure you're dealing with the same person. You want to actually see the person sign because a thief can grab a legitimately signed check, alter it, and bring it into your business. If the customer's contact information is not printed on the check, or it's not up to date, get a current address and telephone number. If something goes wrong with the payment, the first step is to contact the customer and let them know. It might have been an honest mistake and the customer will quickly fix the problem; if not, you might need to notify the customer in writing before taking legal action. Was this check printed by a professional check printer, or was it created by a professional thief? Check to see if the edges are cleanly cut and square, and look for security features on the check. Look for any signs of tampering, like smudging and wear in suspicious places. Use extra caution if the check is from a new account. How can you tell? Look at the check number. A low number (101, or anything similar) usually means that it's the first checkbook issued for that account. That said, anybody can ask to start their checks at a higher number, so check 9900 isn't necessarily from a seasoned account. Insist that checks are written with today's date on them only. If a date in the future is used, watch out. If possible, stick to checks that come from customers who live in the same state as your business. Sure, people move and your customer base might be on vacation, but the risks are higher with an out-of-state check. When in doubt, contact the check writer's bank and ask to verify funds before accepting the check. The bank might refuse your request, and there's no guarantee that the funds will be there even if the bank does verify funds, but it's worth a shot. You could also sign up for some sort of check verification service to help flag suspicious checks. Remember that a check can always be returned, and it might take longer than you expect. 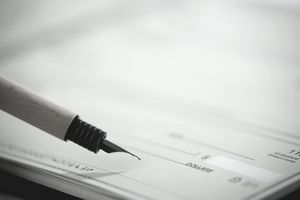 The check clearing process is confusing because your bank may allow you to withdraw or spend some (or all) of the funds from a check before finding out if the check is any good. If it turns out that the check bounces after you’ve spent the money, you’ll need to repay the bank. So how long should you wait? 30 days should cover the most common problems, but wait longer if you’ve got any doubt. Talk to your bank and find out when you’ll know if the money actually arrived.